Over the last four weeks I have been compiling data about Ohio and how it ranks among the other states. I must admit, when I started this project it was tedious and mostly consisted of number crunching and html conversion. However, the more time I spent with the data, the more meaning it took on. It began to tell me a story about Ohio, a story I would like to share with you. The purpose of my data collection was to gain a deeper understanding of the issues surrounding poverty and homelessness. Furthermore my intent was to use and share this data to generate solutions for poverty and homelessness. The data I collected was categorized under five major headings; Population & Demographics, Economics, Housing, Families & Homelessness, Health & Welfare and Crime & Criminal Justice. Throughout my research of Ohio, I encountered some data that was consistent with my expectations, and other data that completely surprised me. Overall what seemed most notable about Ohio was that it was very rarely ranked in the top or bottom five states, but it was consistently ranked far below average in almost every area effecting poverty. To me this data suggests that issues effecting poverty and homelessness are not even on the radar of state and local politicians and that oversight of social service providers is lacking. The data I collected confirmed my previously held belief that the factors that contribute to homelessness and poverty are intricate and complex. While there is no single cause of poverty in Ohio, I was able to identify several prominent contributing factors. These factors include; lack of higher education, lack of employment, racial and socio-economic discrimination, lack of effective social service structures, lack of public resources and lack of public responsibility. Each of these contributing factors separately is a complex problem, yet together they create a seemingly unbreakable cycle of homelessness and poverty that seems impossible to improve. Without a thorough overhauling of all existing public infrastructures, it is difficult for me to imagine an end to poverty and homelessness. Some of the most surprising data I found that pointed to lack of higher education was that Ohio ranks very high for K-12 education, 16th in the nation. Yet conversely Ohio ranks 39th in the nation for the overall attainment of Bachelors degrees, 40th in the nation for college debt and 39th in the nation for women with 4 or more years of college education. This indicates a major disconnect between public education and higher education, suggesting that either not enough of it is provided, people are leaving Ohio to receive a higher education and not returning, or higher education is not accessible or affordable. The data suggesting severe unemployment problems in Ohio was surprising as well. Ohio ’s population growth is incredibly low and is ranked 44th in the nation, while Ohio still ranks 32nd in the nation for job growth. Ohio’s workforce is ranked 47th in the nation. This data suggests that even though businesses are in need of workers, they are still not creating new jobs. 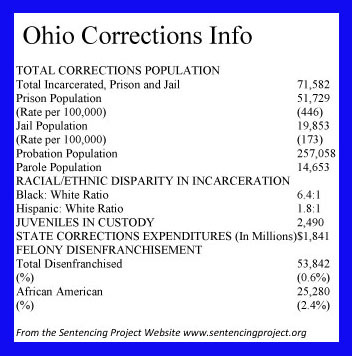 Even though Ohio ranks very poorly when compared to other states in poverty and homelessness, higher education, unemployment, personal income growth, crimes involving theft, overall heath and keeping people from losing their housing, these issues are not at the forefront of the political arena or even talked about by the media. It certainly points to neglect in many different areas. This clearly is a problem that needs extreme talent, creativity, innovation and cooperation to be solved. It cannot be solved by any one person. All of us as Ohioans need to come together as a community and take responsibility for our struggling citizens and hold our political leaders and social service providers accountable to begin to solve problems in our society.